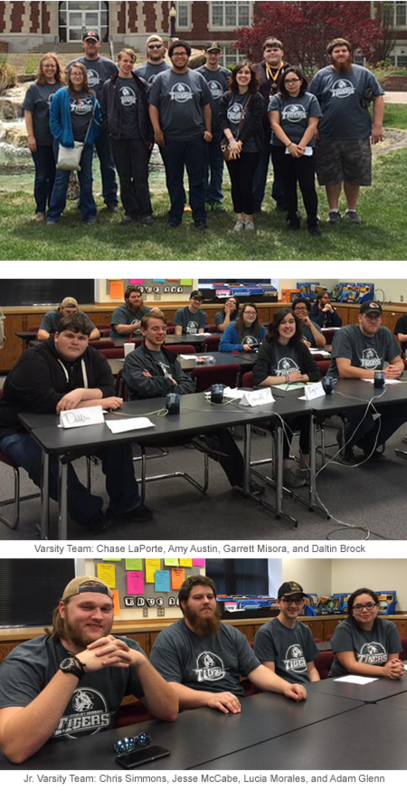 Taking part in the 2016 Kansas Academic Excellence competition, held April 15-16 at Kansas Wesleyan University in Salina, KS, the Cowley College Academic Excellence Challenge teams had a strong showing. The Cowley AEC varsity team advanced to the championship match before settling for a second place finish, while Cowley’s junior varsity team placed first. Cowley’s varsity team was comprised of Chase LaPorte, Amy Austin, Garrett Misora, and Daltin Brock. Dianne Flickinger serves as the coach of the team. In the first round, the Tigers were matched up against the team representing Coffeyville Community College. The Varsity team had a strong performance in the first round defeating Coffeyville by a score of 380-70. Cowley advanced to the next round to face Dodge City Community College. Dodge City presented a better showing, yet Cowley was victorious again, this time by a score of 300-180. In the final round of the first day of competition, Cowley downed Neosho County Community College by a final score of 320-200. When Cowley arrived for competition the following morning, the play picked up against Garden City Community College. This game was all Cowley with a final score of 430-90. Next, Cowley breezed past Allen Community College by a score of 380-110. Cowley would advance to face Cloud County Community College in the semi-finals. This game was referred to as a “cheese melter” by the moderator due to the score at halftime being 180-160 in Cowley’s favor. The Tigers prevailed in the second half by winning 320-260. In the Championship round, Cowley was pitted against Johnson County Community College for a best of three series. Cowley came out of the gate running by handily defeating Johnson 350-210. Intermission was held for the awards presentation. Play resumed after the awards ceremony for the final championship round. Cowley had a few missteps in the second round of the championships falling to Johnson County by a score of 500-170. In the deciding championship match, Cowley was again overcome by Johnson County by a score of 500-170, ultimately handing Cowley’s varsity team a second place plaque and prize money. The Cowley Tigers’ junior varsity AEC team was named the first place finishers, represented by Chris Simmons, Jesse McCabe, Lucia Morales, and Adam Glenn. Individual awards revealed that Chris Simmons ranked first out of 12 student, while Daltin Brock of the Cowley varsity team finishing in fourth place out of 32 students in toss-up questions correctly answered.